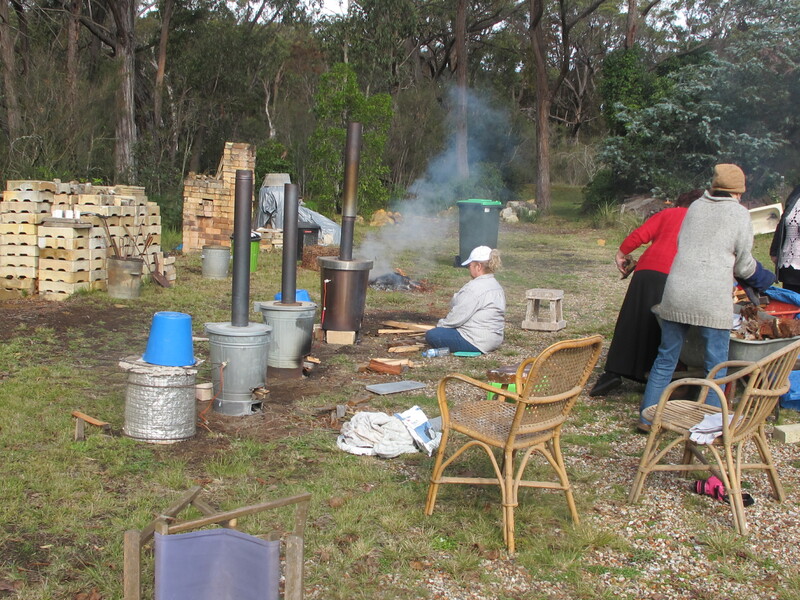 We organise wood firing weekend workshops here through the winter months and some of them are for wood fired raku. 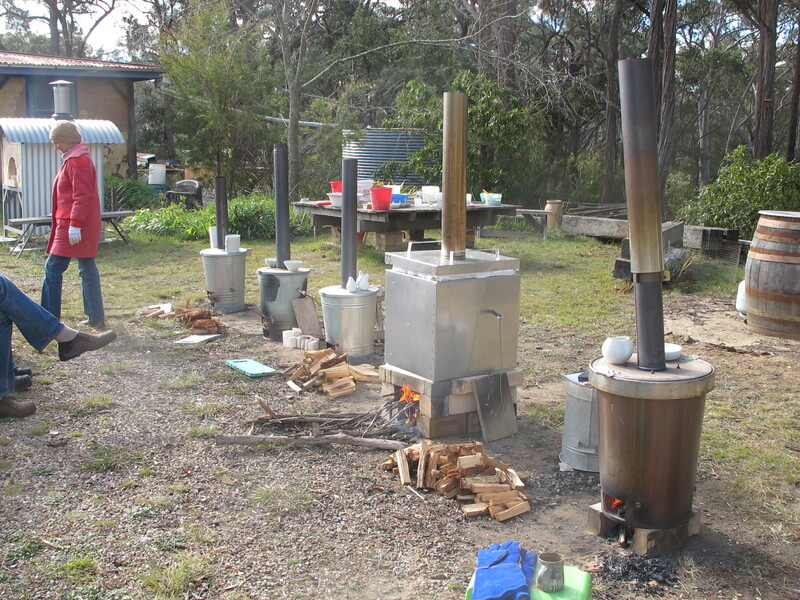 However, Janine uses these little wood fired kilns to do her earthenware glaze firings. 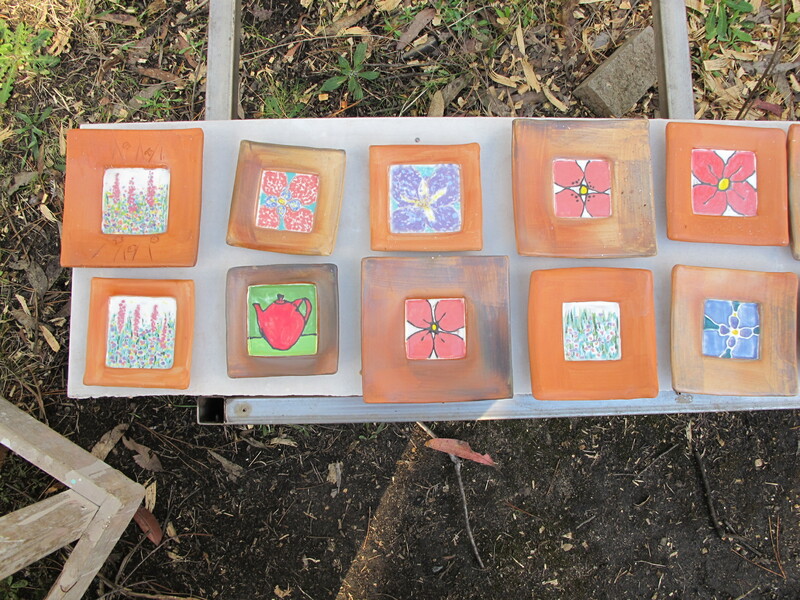 Stefan worked with us here on a few occasions on his visits and he gave us one of his kilns each time he stayed. 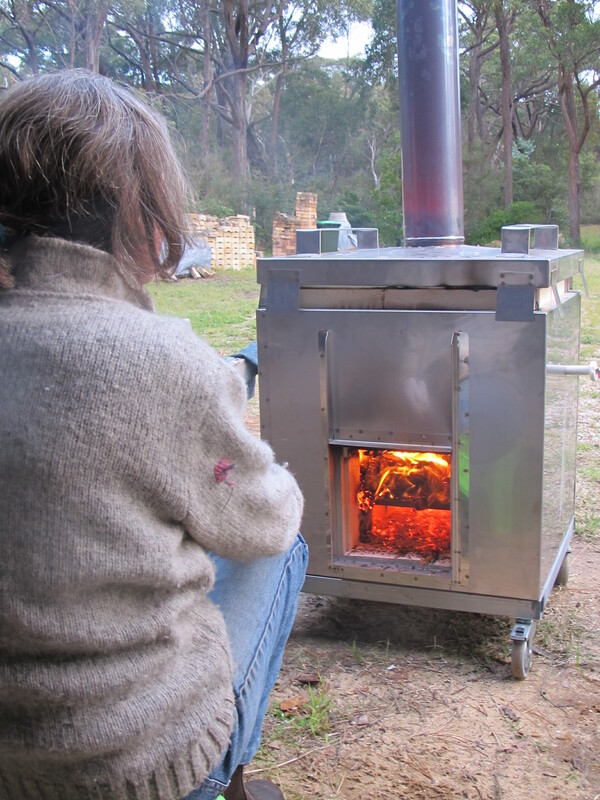 Having seen them work, it got me thinking that there might be another way of thinking about small efficient, portable, wood fired kilns. The only drawback to his fantastic idea is that the internal size of the garbage can is quite small and limited. So I decided to build a slightly larger size version of his concept. I made one lined in ceramic fibre like his original, but square and about 5 times larger in volume, so that we could fire larger and taller pots for the potters who come here for our raku weekend workshops. Now I have just finished a couple of slightly larger square ones lined in light weight refractory insulating bricks. 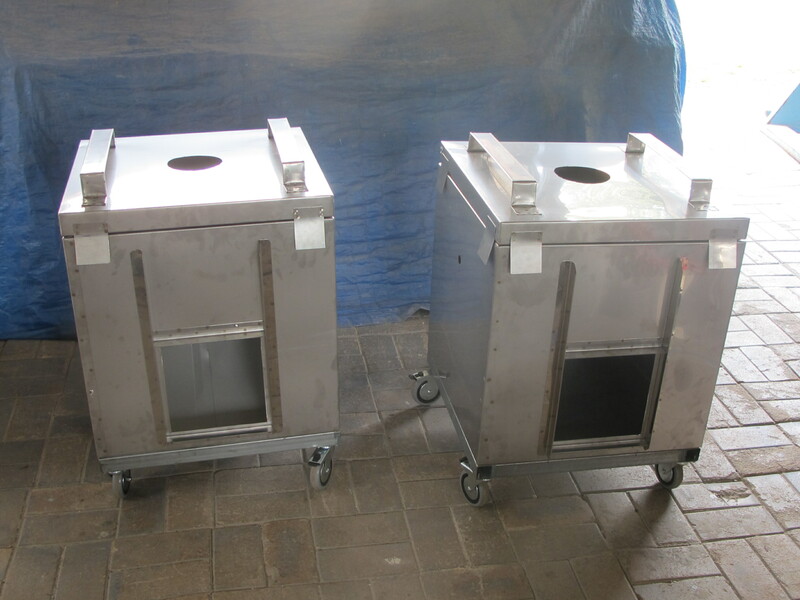 The great advantage of custom building the stainless steel box is that it can be whatever size and shape you think you might want. 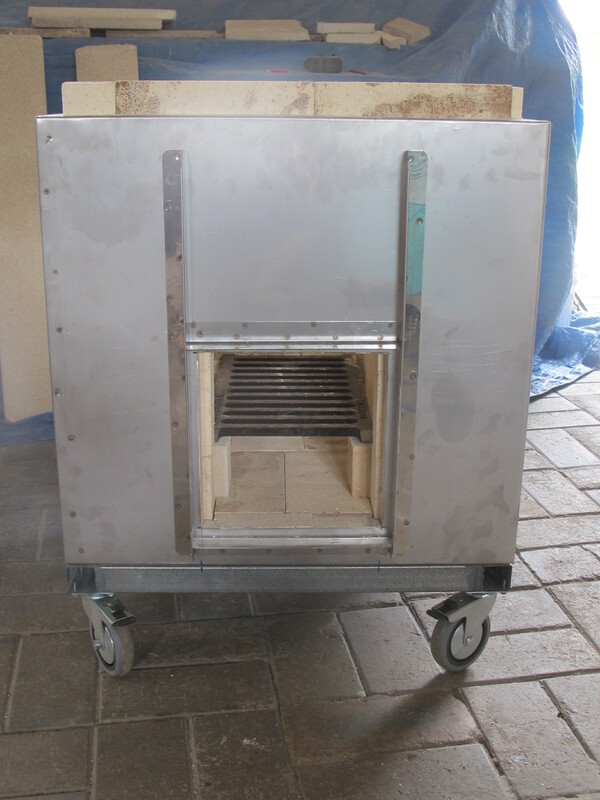 Because this RI brick version is a little too heavy to lift and carry around like the garbage can kilns, I made this one in a custom-built stainless steel box on a galvanised RHS steel tube frame and lockable castor wheels. 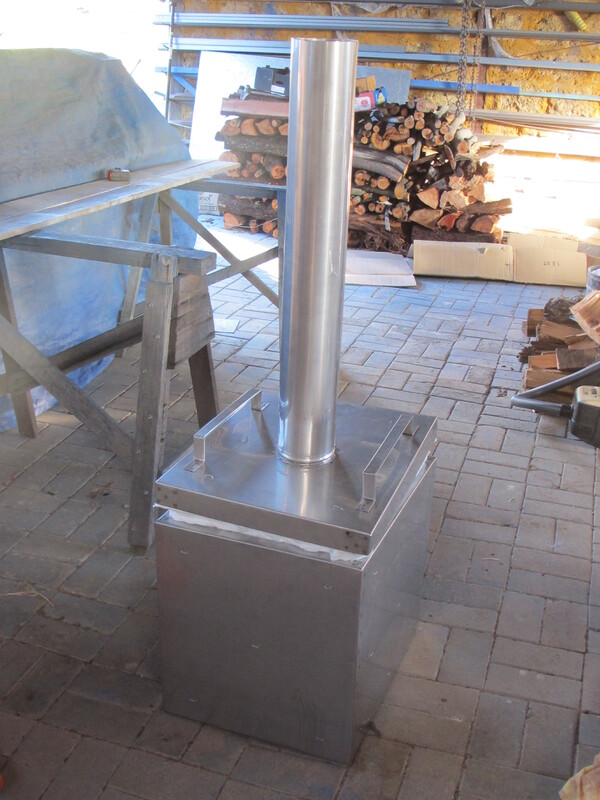 It has all the same advantages of the smaller fibre lined garbage tin kilns in that it is great fun, portable, very quick to fire, very efficient of the wood fuel and being top loading it is very safe, quick and easy to load and unload for raku. I’m always busy. 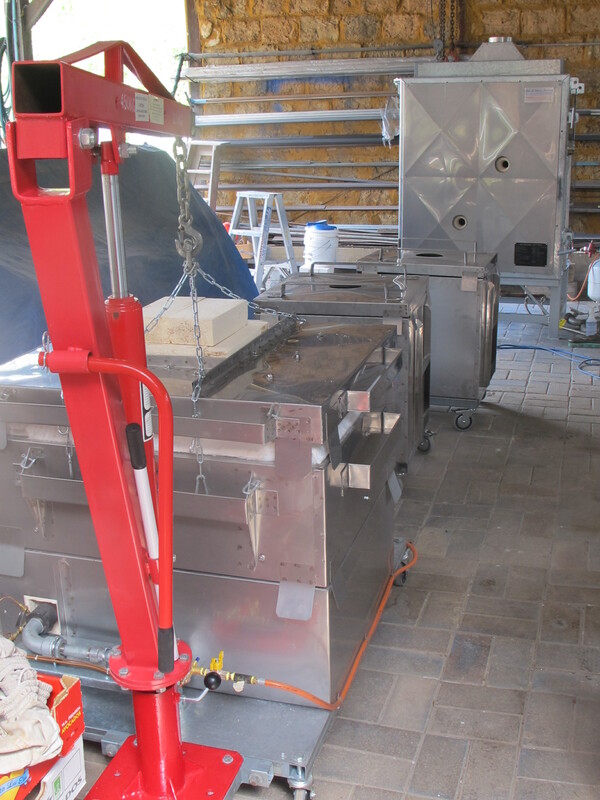 The kiln factory is full with a large gas-fired, front loading kiln, a relocatable top loading gas kiln with an extension ring and two of the new small wood fired raku kilns. 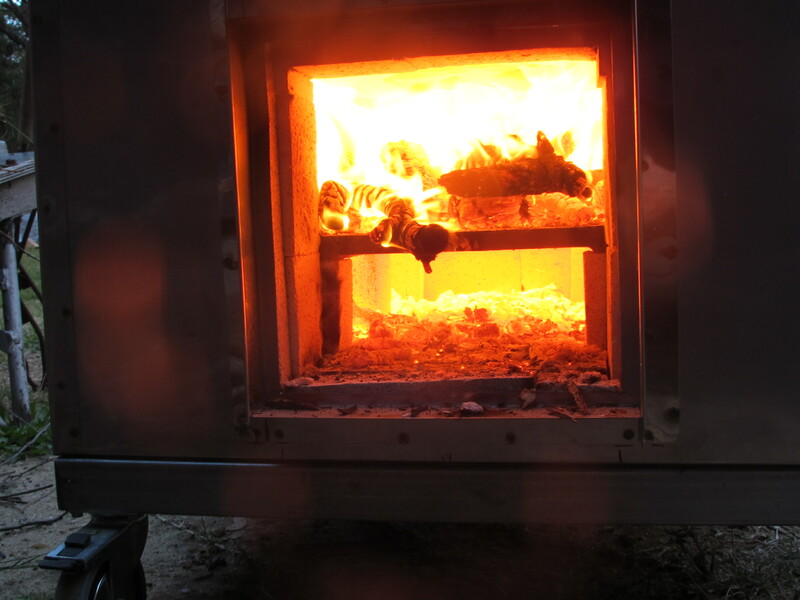 We had our first firing in it the other day, just to test it out and it worked really well. 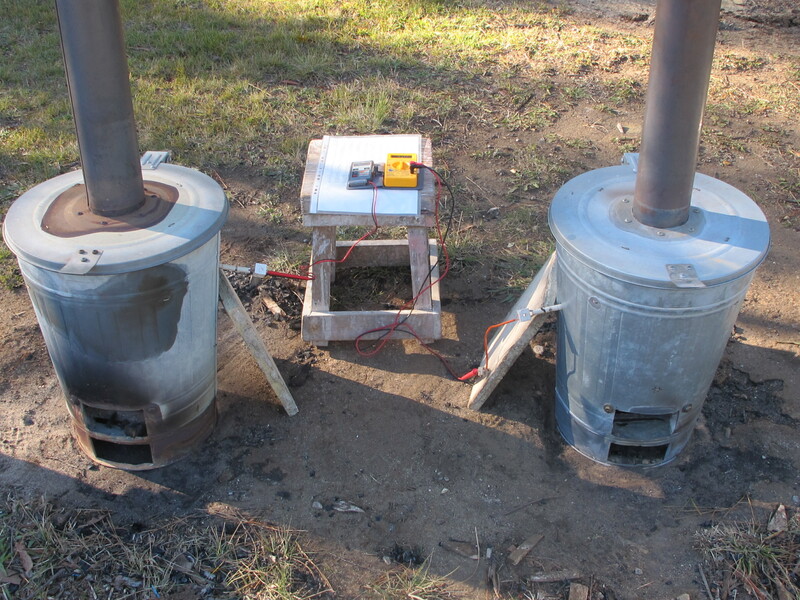 Just 45 minutes up to 1100oC from cold, and then a 15 to 20 minute turn around for the raku. We used such a small amount of fuel, fallen branches/brush wood from the garden. 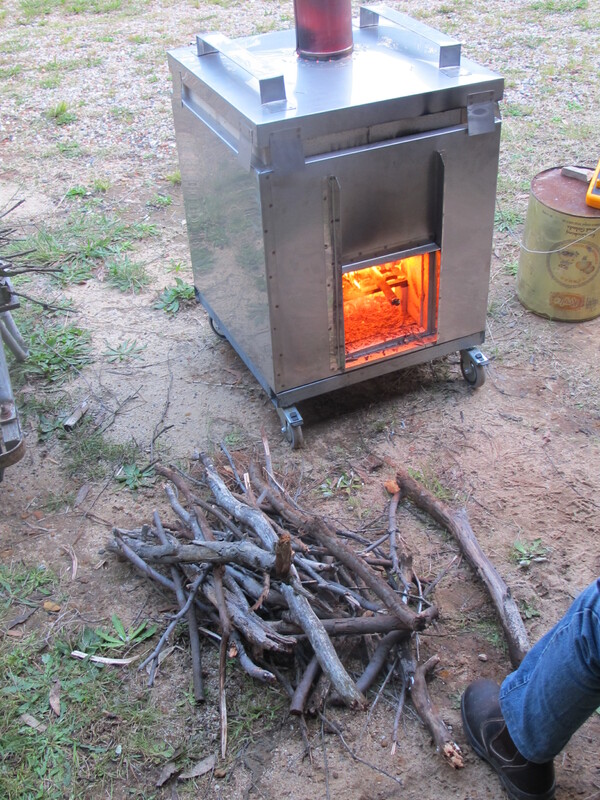 Our big gum trees are alway dropping dead branches around the yard, so it was just 5 minutes work to collect enough for the firing. 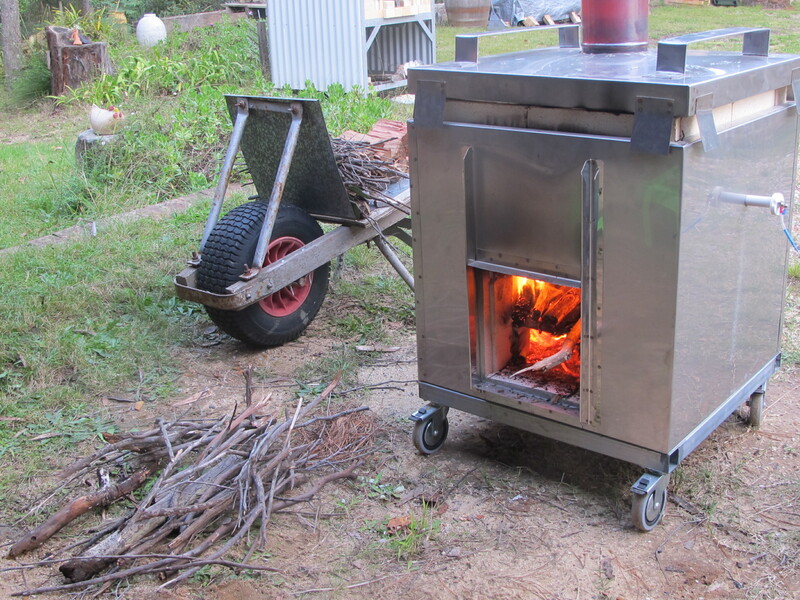 This kiln sailed up to temperature so easily that I think it will be no trouble to take it up to 1200oC mid-fire and even stoneware in the future – when I get a bit more time. 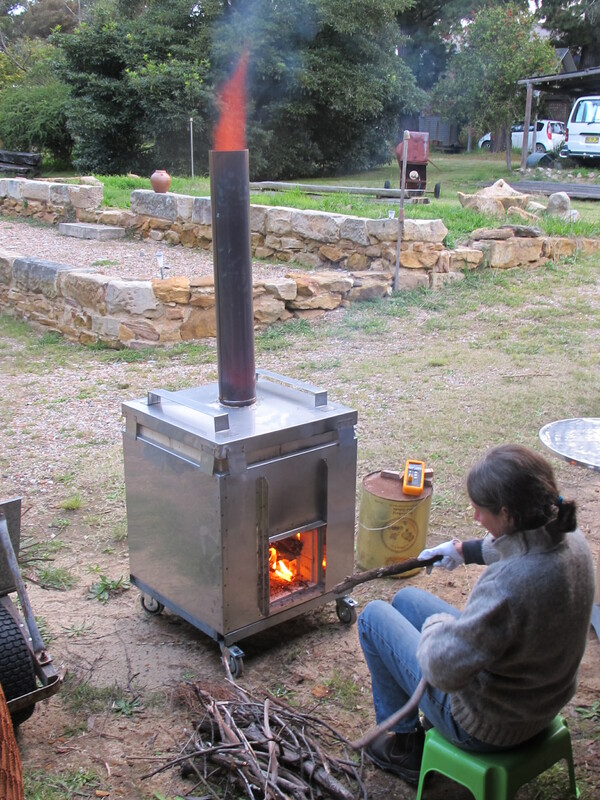 I don’t propose that it will give any wood fired effects in such a short firing time, but it will melt glazes perfectly well. I did some research on one of my locally collected milled stone glazes a while back and I tried firing my little test kiln to stoneware in just 30 minutes with a 10 minute soak. I was able to do 6 firings to stoneware in one day and learnt a lot. If I kept a close eye on the temperature and used test rings to gauge the melting, I was able to get some lovely, soft looking, satiny matt glazes. So it is possible. With so little at stake in a small kiln and the firing being so quick and easy, there is nothing to loose and everything to gain. But more than that, it’s important to me to be able to make my ideas come to life and experiment with different concepts in my own way and in my own time. Play is the best part of work. This entry was posted in Uncategorized by hotnsticky. Bookmark the permalink.